Incumbent Republican Jack Bergman and Democrat Matt Morgan debated local and national issues, including the Line 5 pipeline under the straits of Mackinac. Bergman said he supports building a tunnel in the straits. That plan is also supported by Governor Snyder. Morgan says Line 5 should be decommissioned, and instead he wants more natural gas in the Upper Peninsula. A new tech incubator opens its doors in downtown Traverse City this week. 20 Fathoms will provide workspace and business coaching for eight small tech companies in fields like satellite communications and cryptocurrency mining. Executive Director Andy Cole says local investors are eager to help new businesses get off the ground. "Traverse City's a really small town, but it is incredibly dense with entrepreneurial and technology talent,” says Cole. “And then also has a really untapped, but important investment community." 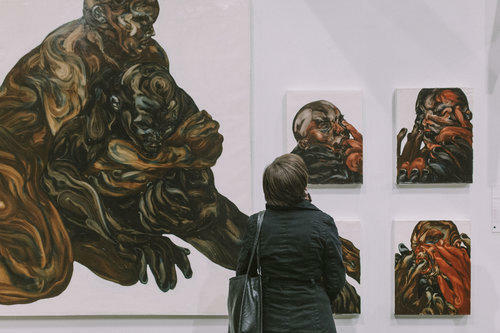 Spencer McQueen says looking at his art isn’t enough. He wants you to feel his paintings. “It’s just this little extra ability that you can give someone to connect with you and the things that you created,” he says. In the early 1800’s, American painter Edward Hicks began painting “Peaceable Kingdom," a series of 62 paintings inspired by a verse in the book of Isaiah. In Traverse City, two different art galleries are bringing that concept to the art world. A couple years ago, Chris Andrews, a senior at the University of St. Andrews in Scotland, realized he was addicted to his smartphone. Ambrosia Sipping Chocolate is a brand new, gourmet hot chocolate that’s made in Traverse City. It hits the market on April 15th. “It’s literally like you’re drinking chocolate bars because that’s exactly what it is,” says co-owner Matt Shepler. Traverse City officials are teaming up with an LGBT organization to build a piece of public art downtown. The city Arts Commission plans to erect a “wishing tree” in the Warehouse District during the annual Up North Pride week in June. 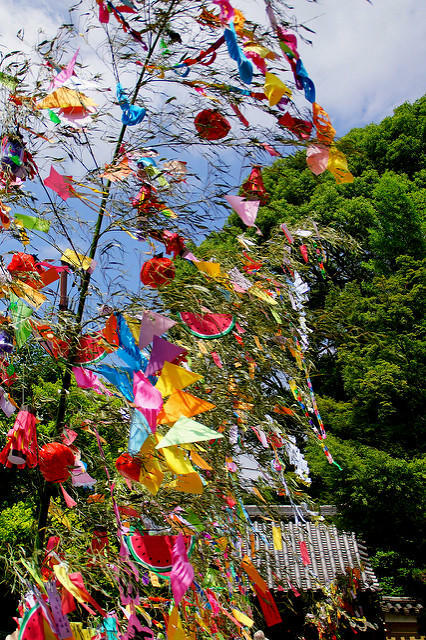 The tree is meant to hold handwritten wishes tied to its branches. The City Commission approved the project Monday night and approved spending up to $2,000 on the tree. Traverse City resident Rick Buckhalter opposed the project. He said the Arts Commission is overstepping its bounds. Traverse City will not write Proposal 3 into its zoning laws. Prop 3 was passed by voters in 2016; it forces a public vote on any building over 60 feet tall. The law became part of the city charter but not part of its zoning code. Mayor Jim Carruthers said at a meeting last Monday night that writing the law into both places would clear up confusion. But most city commissioners – including Richard Lewis – disagreed. A new piece of public art will be unveiled in Traverse City Tuesday afternoon. 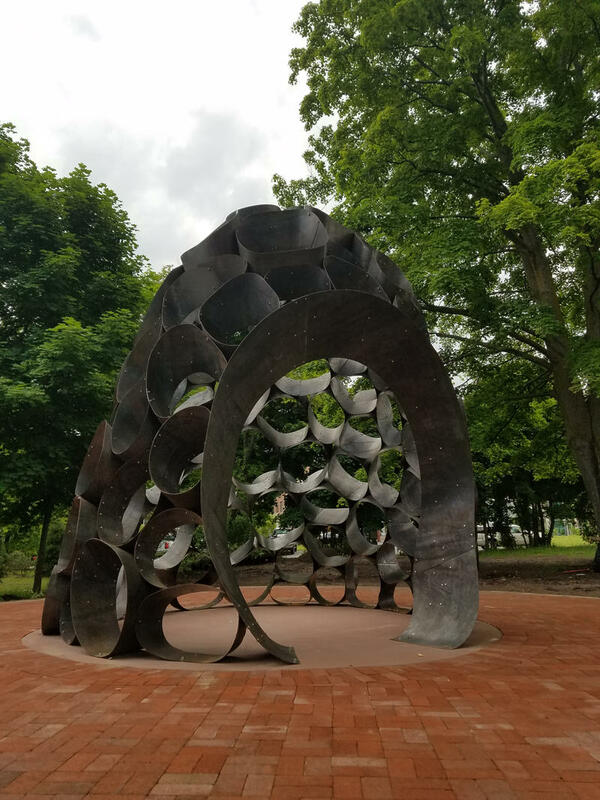 The metal sculpture is over 14 feet high and is located in Lay Park. Artist DeWitt Godfrey designed the sculpture. He says he hopes it’ll be a place of contemplation. Traverse City commissioner Richard Lewis says the downtown area wouldn't be what it is today without Bryan Crough's vision. A judge sentenced a Traverse City man to one year in prison for assaulting a homeless man last July. For the first time since his arrest, 19-year-old Maayingan Brauker admitted to the crime at his sentencing hearing in 86th District Court Tuesday. A Traverse City man was convicted Monday of assaulting a homeless man. After a day-long trial, jurors found 19-year-old Maayingan Brauker guilty of assaulting David Whitney, who was kicked and punched last July while sleeping near Central United Methodist Church. Chris Sims doesn’t think that the Traverse City art scene is bad, it’s just that it can get a bit insulated. Chris is the founder of Prjct omni, an art project that features contemporary art from all around the world. Last Friday, Prjct omni’s second exhibit opened in the Warehouse MRKT in Traverse City. And while most of the response was very positive, some of the paintings got a few folks a little riled up. But Chris says even a negative reaction with art is better than no reaction at all. Voters in Traverse City have passed Proposal 3, which will require a public vote for any building over 60 feet in the city. Prop 3 passed with 53 percent of the vote. 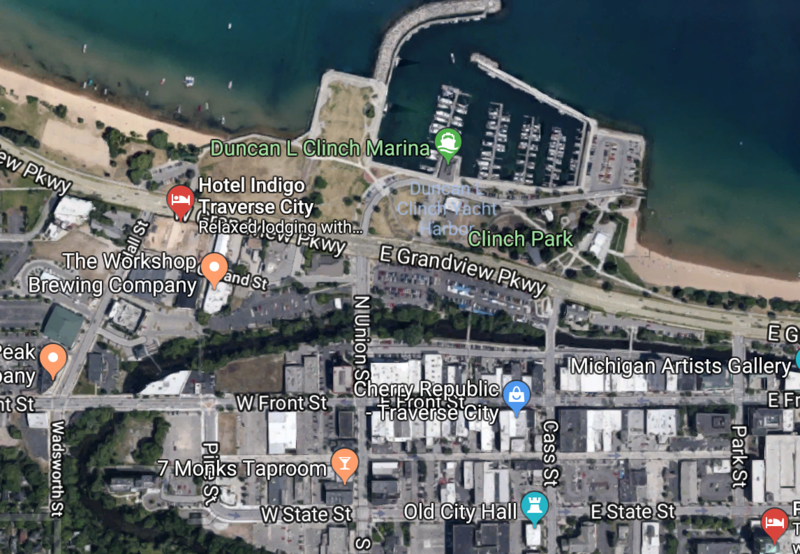 It will amend Traverse City’s charter, taking away the city commission’s ability to approve a building taller than 60 feet without a vote of the people. The debate over Prop Three has been contentious. Both sides have said the proposal is likely to be decided in a courtroom. 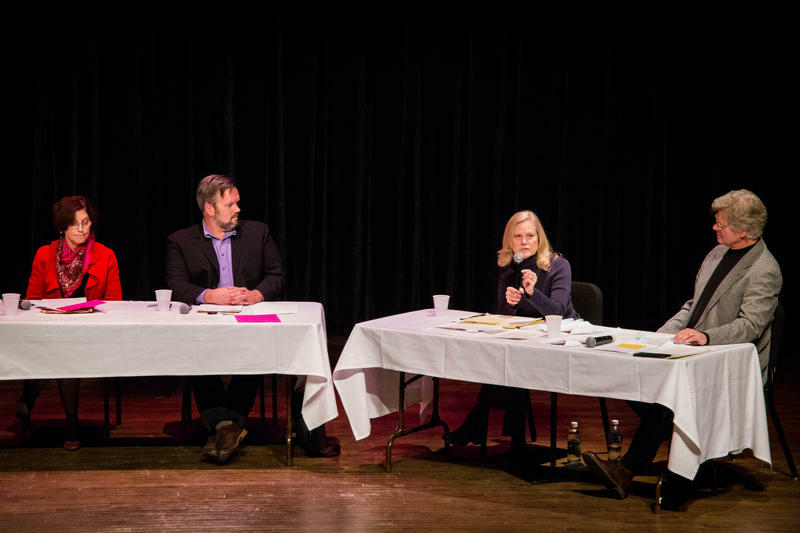 Members of the two groups on either side of the Proposition 3 issue in Traverse City gathered at the City Opera House Wednesday night for a debate. Prop 3 would send any plans for a building over 60 feet tall to a citywide vote. Former city commissioner Jeanine Easterday and restaurateur Paul Danielson represented Stand Up TC, a group opposed to Prop 3. Attorney Grant Parsons and law professor Brenda Quick represented the Save Our Downtown campaign committee, a group that supports Prop 3. IPR News Director Pater Payette and reporter Aaron Selbig moderated the debate. Traverse City has called in an expert to help with its growth and development issues. The city hired consultant Joe Minicozzi to take a look at the economic impact of land parcels throughout Grand Traverse County. Minicozzi says Traverse City is on the right track to growth and development. A brightly colored piano was unveiled in Traverse City on Thursday evening. It sits in the middle of a new gathering space near the intersection of Front and Park Streets downtown. About 50 people of all ages stopped by to enjoy the warm evening and some free music. Eric Patterson wakes up around 7 a.m. He pulls his hair back into a bun, puts on a beige suit and heads out the door. 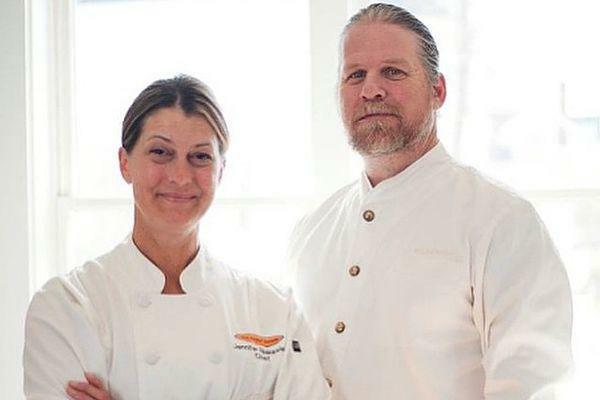 He is the owner of Cooks’ House in Traverse City, a well-known farm-to-table restaurant. Previously, he worked as a chef at three Michelin-starred restaurants. He was head chef at Andre’s, a famous restaurant in Las Vegas, where he relished the thrill of finding the ingredients, preparing dishes and working for hours behind the stove. The stress of the job kept him going for years. Outdoor cafes in Traverse City could be moving from the sidewalk to the street. 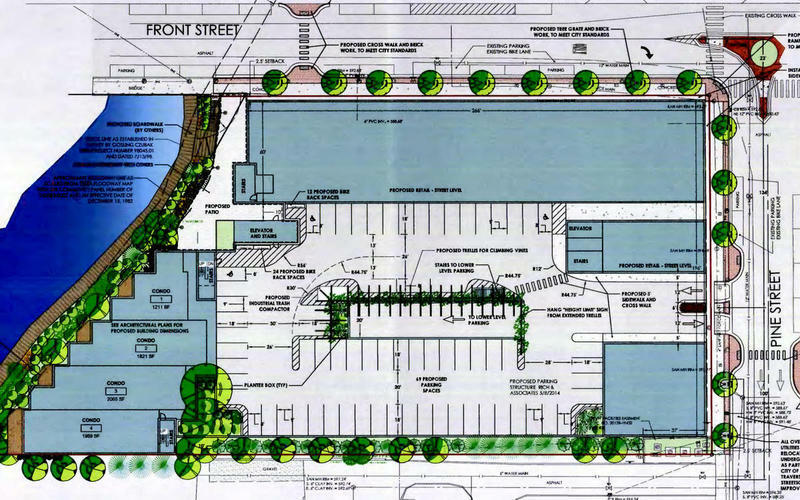 The Downtown Development Authority is debating a plan to allow “platform” cafes, which would take up two parking spots outside a restaurant. The Downtown Development Authority will discuss the concept Friday morning. 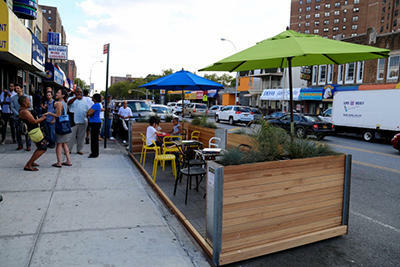 DDA Executive Director Rob Bacigalupi says he wants to loosen rules on sidewalk cafes that were passed two years ago. It’s been 35 years since the heyday of video game arcades. By the late 1980s, most arcades had died, but over the last few years, the classic games started making a comeback, popping up in hip neighborhoods in major cities. A Traverse City couple saw the trend and decided they wanted in on the action. Last week, they opened their new arcade, the Coin Slot, in the warehouse district. It’s the first time I’ve been in a real arcade in I don’t know how long. When chef John Larson and his family moved from Chicago to Traverse City last spring, he soon realized that getting a table at a downtown restaurant was a bit difficult at times. "There weren't enough restaurants," says Larson. "I noticed every single place was on a two-hour wait during the summer months." That was good news for the entrepreneur from Chicago. Just over a year later, Mama Lu's is now open for business just in time for the busy summer months in Traverse City. A dozen high-quality art reproductions will be placed throughout downtown Traverse City on Wednesday. 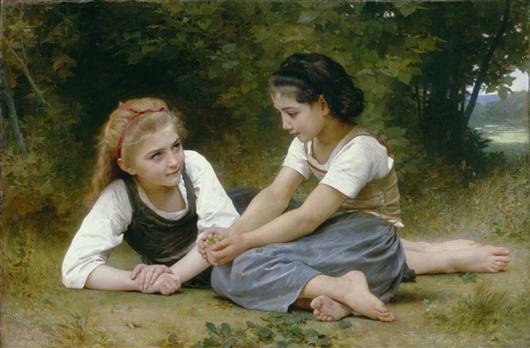 Among them is “The Nut Gatherers” by William-Adolphe Bouguereau, and “Reeds and Cranes” by Suzuki Kiitsu. Inside|Out is a program from the Detroit Institute of Arts that brings replicas from its collection to different locations around the state. Do you think Traverse City is headed in the right direction? 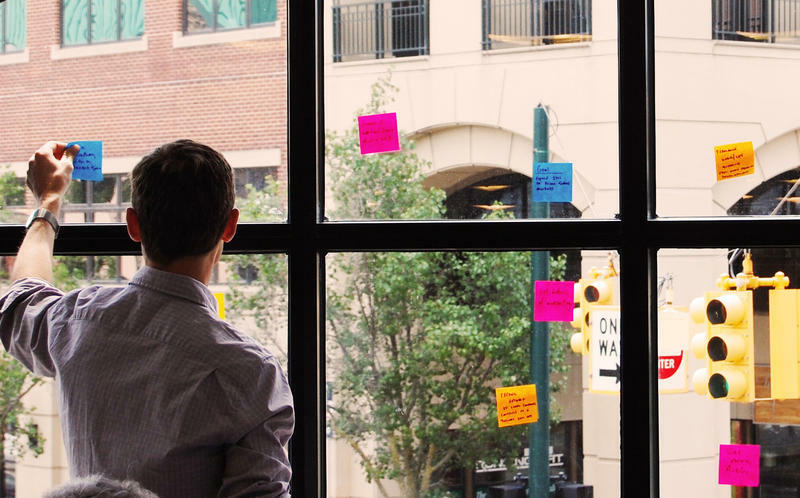 Join us today at 1 p.m. for an hourlong call-in program about the future of Traverse City. Our panel of guests will discuss future plans for Division Street, the need for walk and bikeability and the heated debate over tall buildings. You can call in during the show with your thoughts and questions at 231-276-4432. You can also submit questions on our Facebook page or on Twitter (@IPRNewsRadio). The Traverse City commission decided today not to appeal a judge’s ruling on the nine-story Pine Street development downtown. Last month, judge Philip Rodgers said the commission acted improperly when it approved a permit for the development. The commission voted this afternoon on whether to spend $10,000 to hire a lawyer to work on an appeal, but approval failed by one vote. City Commissioner Amy Shamroe says the city will still work to improve the permitting process. A judge has ruled that Traverse City commissioners should not have approved a Special Land Use Permit for a nine-story building development downtown. Grand Traverse County Circuit Court Judge Philip Rodgers vacated the permit on Thursday. Rodgers said the city commission did not gather information legally required for the permit before they approved the development. Developers can go ahead with their plan to build a nine-story building in downtown Traverse City. The city commission voted last night to approve a Special Land Use Permit - or SLUP - for the project. The vote came well after midnight, after three hours of public testimony. Mike Jackson took issue with the idea that the building would provide much-needed workforce housing.